Eureka used 110,000 tonnes of concrete and weighs 200,000 tonnes. The Edge Experience is proclaimed to be like no other experience in any other building in the world! 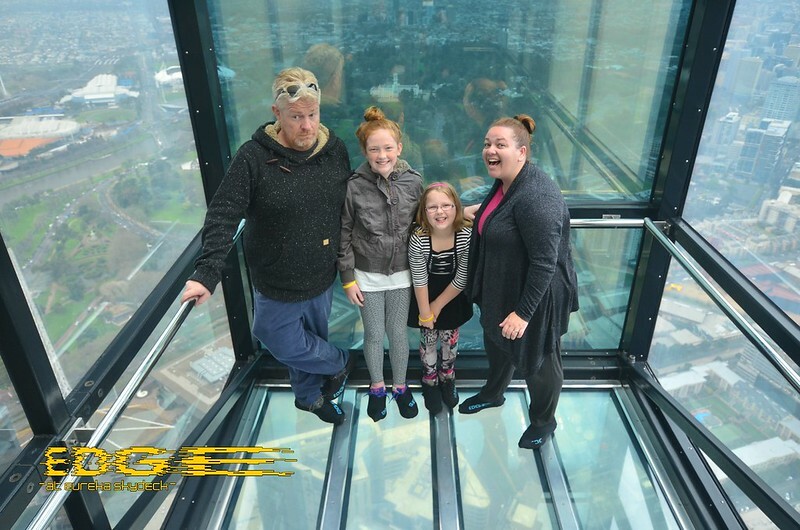 The Eureka Tower Skydeck is home to a World First experience that has since been copied all around the world called ‘The Edge’. The Edge slowly slides out from the comfort and safety of Eureka Tower’s 88th floor. Once extended, you are nearly 300 meters over Melbourne in a glass cube. Yes, you heard me right, glass walls, ceiling and floor – you can see through it all! As an extra as the cube slides out the glass is frosted until the cube is all the way out to the edge when it suddenly goes clear and you get the sound effects of cracking glass! This sent my Bec and Willow a pale shade of white as they clung to the sides of the cube semi-paralysed by fear. The view from up there was absolutely amazing and seeing the tiny people below us was fantastic. After a little while, Bec may have slightly loosened her extremely firm grip on the rails and relaxed a little to enjoy the view! But in all honesty to say they were happy to get out of the cube and back on terra firma is an understatement It was with the haste of people rushing an open bar or me leaving work! 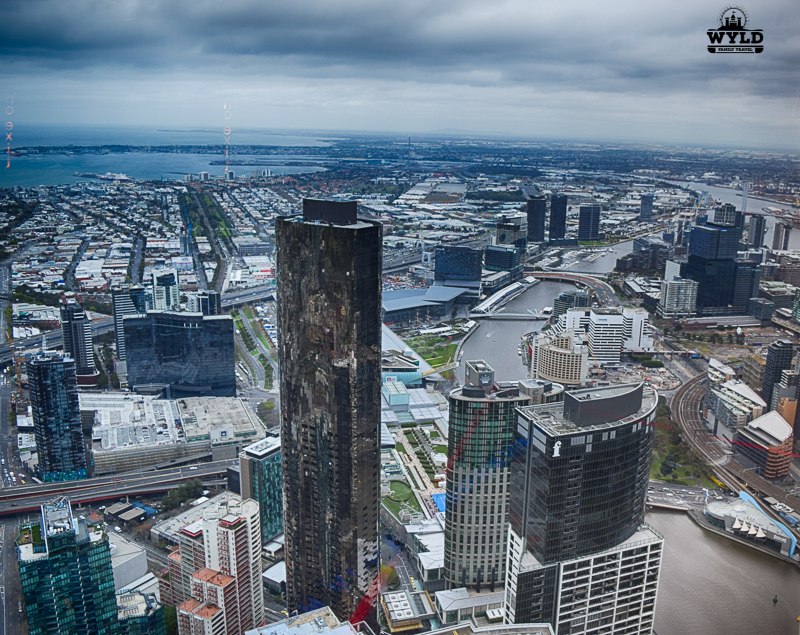 It’s an amazing view, when you are in the cube, gives you a sense of flying high above Melbourne. The Skydeck Melbourne towers above the city. 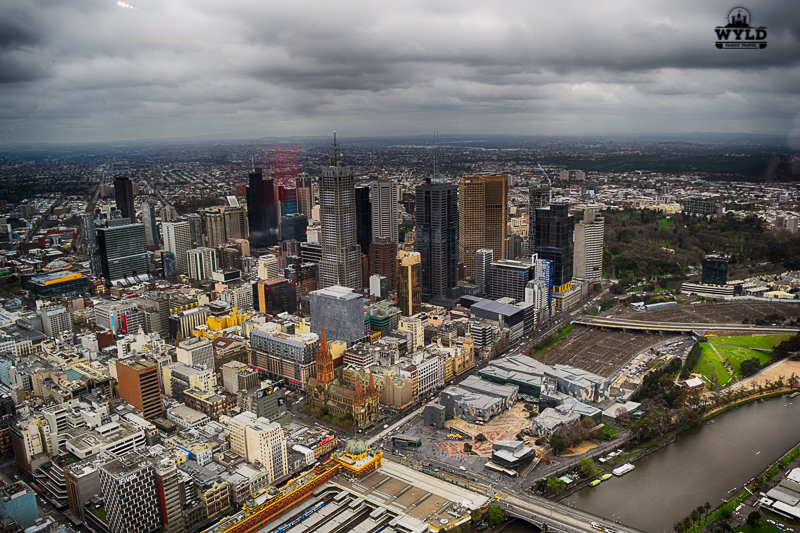 As you move around the Skydeck you are provided with an unmatched view of Melbourne. You see Southbank Promenade below, boats cruising the Yarra, planes coming to land at the airport, people walking and riding bikes (They look like ants you are so far up) There is even an outside viewing platform that you can access through an airlock. The platform lets you see the city skyline and sporting precinct through the naked eye. It can be cold in Melbourne at the best of times let alone when you are 300 meters up. Hence being out in the open really gave us a taste of just how cold it really was. One of the great things about the Skydeck is the complimentary binoculars that are situated all around the Skydeck for you to use. There are also at two heights which are fantastic for the kids! Marley was just the right height for the smaller sets and she loved that she could look into them whenever she wanted! There is also a cafe where coffee and light snacks can be bought. The girls enjoyed a cheese and biscuit packet. Mark and I enjoyed a lovely coffee while taking in the views. There are ample and very clean toilets both while you are waiting to go up to the viewing platform and once you are up there which is really important for us as we seem to need them quickly! I think it’s fair to say Eureka Tower Skydeck will now be making the list of my top 5 things not to miss in Melbourne. As a family we found the Skydeck to be a great attraction to visit. We have been to Berlin 360, Munich Olympic Tower and Montparnasse in Paris which all offer viewing decks. The thing that stands out about the Skydeck besides the cube experience is the floor to roof windows that give what can only be called an all-encompassing view of Melbourne. 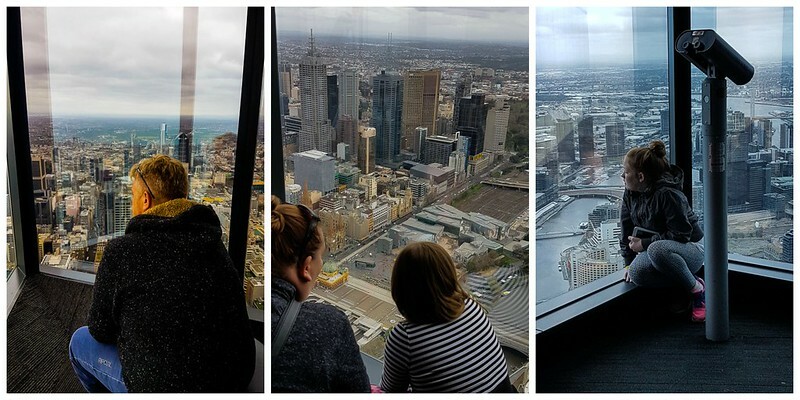 This is an outstanding feature that puts Eureka Tower Skydeck above all other viewing platforms we have visited. The second thing that stood out was the cleanliness of the windows. Therefore I am not sure if we just caught a good day or not but they seemed really clean which sometimes can be a huge issue at this height. We spent 1.5 hours looking, exploring, and viewing all the pros and cons of the Skydeck. The Skydeck has a range of photo options that capture your experience in the cube and the walk. ‘The Walk’ is a specially constructed green screen set that gives guests the illusion that they are crossing a tightrope high. You are transported onto a tightrope high above the streets of Melbourne. Also after you have finished your viewing and have taken the lift back down to the ground there is a gift shop on the ground floor. There are great souvenirs that we think were very well priced! Both the girls got a little key chain for their school bags and Mark got a belated Father’s Day gift of two Sky Deck cushions for the couch! We also got some other gifts to take with us on our upcoming trip overseas to give to some friends. As Mark stated above both myself and Willow don’t deal well with heights especially these heights! In saying this it was still something neither of us wanted to miss out on. The Edge Experience was the one thing that really frightened me. I was reassured that if we needed to leave the cube we could knock on the door and we would be taken out immediately. The understanding of the young lady who gave us the instructions before we entered was fantastic. She could see that we may need to come out. It is probably something they see on a regular basis but knowing that they have recognised your fear is really reassuring. It was a great experience even though I was frightened. I said to Willow we would be upset if we didn’t at least try and we both SURVIVED!!! As for the rest of the Tower, we had absolutely no worries walking around even with the crystal clear floor to ceiling windows! Consequently, both Willow and I are so glad we did it! Jumpstart your heart with a trip to the 88th floor of Eureka Skydeck 88. This lookout gives you stunning panoramic views of the Dandenong ranges by day and the dazzling Melbourne skyline by night. Easily located just off Southbank promenade. Spend a few hours looking over Australia’s number 1 city. Book your Skydeck tickets HERE. Eureka Tower Parking is easily accessible by car. Wilson Parking “Riverside Quay” is one of two amazing locations. Located 100 from Eureka Tower on the corner of City Road and Southgate Avenue (enter via Southgate Avenue). We parked here on our visit to The Eureka Tower Skydeck and we can tell its literally 5 minutes away. 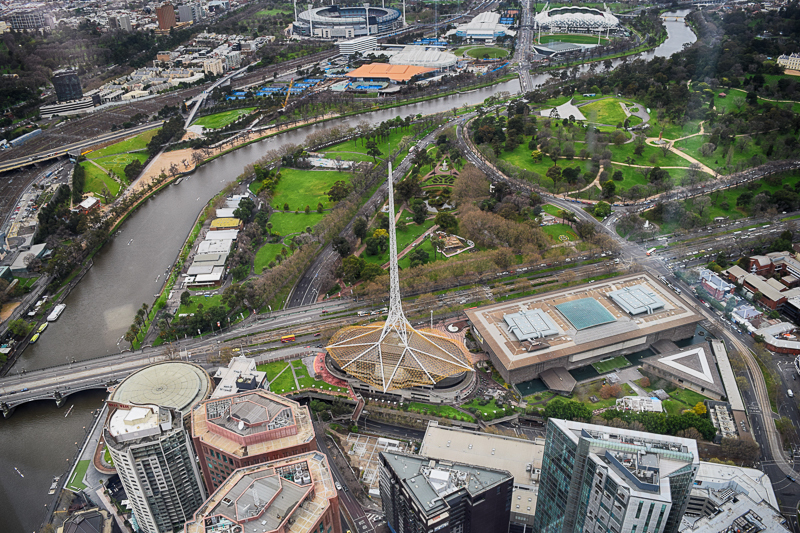 Very convenient to visit the Skydeck and any attractions on the south side of the Yarra River in Melbourne. We recently visited again in June of 2017 and this time we parked at Eureka car park. This is the ultimate for Eureka Tower Parking as it beneath the building. The Eureka Skydeck was nice enough to provide us with a Eureka tower ticket. Our views expressed here are our own and are no way influenced by our free entry on the Eureka Skydeck. Update June 2017 – Melbourne Ice Slide Winter in Melbourne. The Eureka Skydeck in association with the variety club has introduced an ice slide. The Ice slide Melbourne is located adjacent to the Eureka Tower on the Southbank promenade. The Melbourne Ice slide is 36 meters long and 4 meters high. The Ice Slide Melbourne was amazing fun for the whole family. It’s a great activity for winter school holidays Melbourne. Well done for facing your fears Bec and Willow! I love the views from Eureka and your photos are making me miss Melbourne even more #homesickinlondon! My husband and my mother in law are also afraid of heights and I have to remind myself not to drag them to some places because of it :-9 While saying that, they are still up to tackling their fear in some places :-9 I would personally love to explore this tower – the view on your photos looks amazing and it must be a strange feeling too to be so high up! There are so many places I need to visit in Oz and now you guys have added another to the list! I was in anticipation when I saw the title and was certainly surprised to find out where the Skydeck is located. Your children are quite special to take your advice and at least “TRY”. An incredible lesson for life as well: when you’re afraid, just try. Sometimes you’re rewarded sweetly. Enjoyed reading about the experience at so many levels. That’s an exciting experience indeed. I was reminded about a similar experience in Macau at the Macau tower. Walking on the edge of course is not for one who has the fear of heights. Incredible view from the tower and awesome quality photos!! Thanks for sharing! Looks really cool! Going up buildings can be so much fun, but a lot of times I feel like one starts to look like another… BUT I have to give you some MEGA props for facing your fears and going up it! Thanks for sharing! I’m not great with heights either, but for some reason I still end up in towers and skydecks a lot. I love that binoculars have two set heights (makes it much easier for kids to use)! I’m with Bec and Willow. I’m not sure I could have gone through with it, though! Here in Chicago, we have a similar experience at Willis Tower. I’ve yet to give it a go… You did get some pretty awesome photos! I love heights, and having a coffee on this deck would be incredible for me. Can’t wait to go there! This sounds incredible! Maybe not the cracking glass part, but the whole experience must have been so much fun. Especially for those views! I only spent a few days in Melbourne when I was there 5 years ago but if I ever return, I’ll be trying this out for sure! Emma I think people underestimate Melbourne as a destination and choose instead to spend more time in Sydney. Thanks for sharing and I love to go to observation decks as I like to appreciate the cityscape. Convincing your entire family to visit the skydeck 88 is impressive! Also, I loved the floor to ceiling glass so you can really have clear views of the entire city! I’ve only visited the sky deck in Philadelphia, I have so much more to check out around the world. I look up to that building every day. Well done for surviving the Edge Experience! It’s scary but fun,isn’t it?! Erin by chance we are headed to Copenhagen in January for a few days on our way from Reykjavik to Dubrovnik.